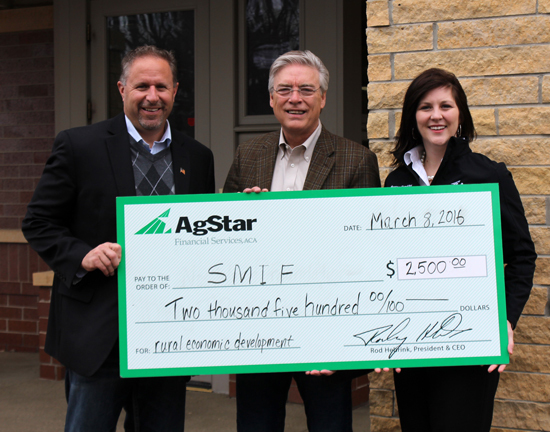 OWATONNA, Minn., March 10, 2016 – The AgStar Fund for Rural America, the corporate giving program of AgStar Financial Services, ACA, has donated $2,500 to support Southern Minnesota Initiative Foundation’s (SMIF) general endowment fund. AgStar has been an annual supporter of SMIF since 2007, investing more than $200,000 in the organization through sponsorships, disaster recovery and general support over the last nine years. SMIF, a donor-supported foundation, invests for economic growth in the 20 counties of southeastern and south central Minnesota. The Foundation marks its 30th anniversary by having invested more than $97 million in the past three decades through grants, loans and programming. SMIF's key interests include early childhood, economic and community development. For information on SMIF, visit www.smifoundation.org or call 507-455-3215. AgStar Financial Services, ACA, headquartered in Mankato, Minn., employs more than 550 full-time team members. The company is part of the national Farm Credit System and has a public mission to serve 69 counties in Minnesota and northwest Wisconsin. AgStar’s industry specialization, client segments and market delivery systems result in diversification nationwide. The company has expertise in the corn, soybean, swine, dairy and bio-energy industries. AgStar has developed successful programs in loans, leases, crop insurance, consulting and rural home mortgages. As a value-added financial services cooperative, AgStar allocates patronage dividends to its 15,400 stockholders. The company is also committed to giving back to rural residents, organizations and communities through AgStar’s Fund for Rural America. Visit AgStar.com for more information. Southern Minnesota Initiative Foundation (SMIF), a donor-supported foundation, invests for economic growth in 20 Minnesota counties. The Foundation has provided more than $97 million in grants, loans and programming within the region during the past 30 years. SMIF's key interests include early childhood and economic development. To learn more about our work and mission call 507-455-3215 or visit www.smifoundation.org.